A book lover I am. From a very young age I loved reading, I can recall the book reading challenges in school and reading as many books as I could get my small hands on. As I grew my bookshelves grew, they were bursting from the seams with all my favourite authors and series. Now in my home my children are the ones with overflowing bookshelves, I normally donate my books once I read them in mom groups so my collection doesn’t overtake my home. I have always been curious about eReaders but, to be totally honest, I thought I would miss the feel of a real book in my hands. Turning the pages, the smell, the excitement of heading to the bookstore to find a new read, I didn’t know if I could go without that. 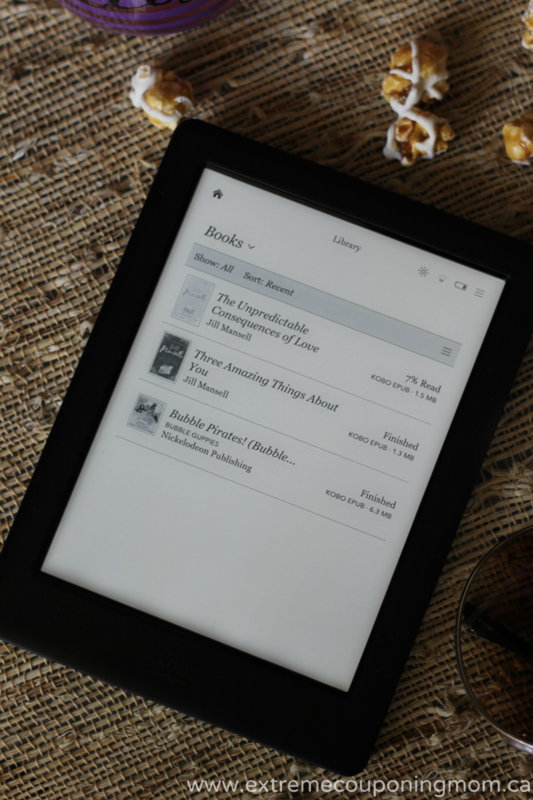 Recently I was offered the chance to test drive the new Kobo Glo HD for 7 days and see what I thought about putting down my real books for an eReader. I will admit I was hesitant and didn’t think I would like it but I am a believer in giving things a chance so I decided to give an eReader a shot. After setting up my Kobo Glo HD the first thing I checked out was the Home screen, it was very easy to navigate through and easy is what I like! I definitely didn’t want using an eReader to be harder than opening my fave book so this was a huge plus. Another amazing thing about the Kobo Glo HD is that it can hold up to 3,000 books in your library – that is one heck of a lot of reading! Being able to carry my entire library around with me, no matter how small (at the moment), or big it gets, I can have a great read at my fingertips. It also has an amazing battery life of up to 2 months, so reading an entire book on a single charge and not needing your charger is not only possible it is an awesome reality. I love that the Kobo Glo HD is extremely compact which is great for reading on-the-go! It is also much lighter than a hardcover book, having carpal tunnel from years of computer work sometimes I would find my wrists getting super sore from holding a book which really hindered the length of time I could read for. It also props up nicely on a pillow when wanting to read in bed. I enjoy reading before bed and did this a lot with my new eReader. One of the first things I noticed when I opened my first book with the Kobo Glo HD was how incredibly similar the pages looked to a regular book. This made me very happy as I always thought there would be either too much glare that it would hurt my eyes to read too long or that it would be the complete opposite and be too dull to read. 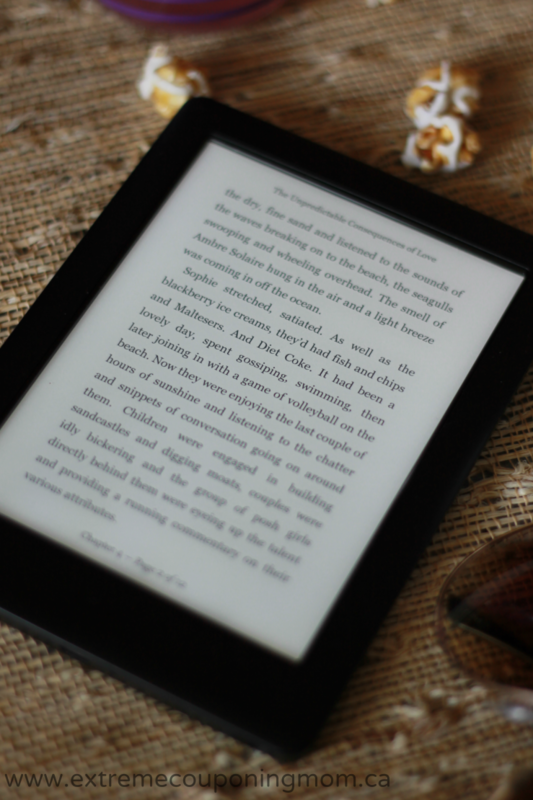 It gives you the comfort of the clearest, most book-like 6″ HD Carta E Ink touchscreen with fully adjustable ComfortLight and the convenience of adjustable fonts, sizes and margins. This is a huge selling point for me as I am one of those people who need glasses but refuses to wear them. I don’t know why but I have yet to find a pair that actually looks good on me and well I don’t drive so glasses are not a priority. So being able to adjust the font to the size I can comfortably read at is key – can’t do that with my real books! 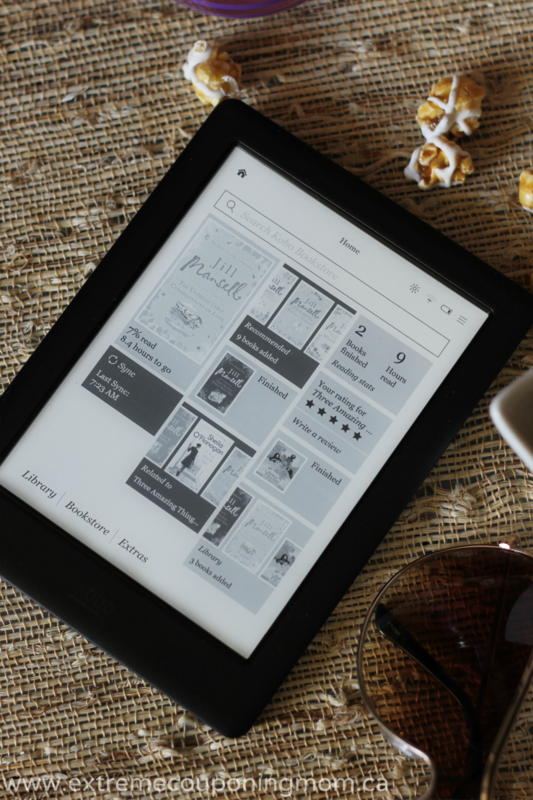 With easy and instant access to Kobo’s 24/7 eBookstore through Wi-Fi I have millions of the best eBooks at my fingertips and can start my next read whenever I want. I have already purchased some books to read to Bella, Bubble Guppies of course and have two for myself by my favourite author Jill Mansell. 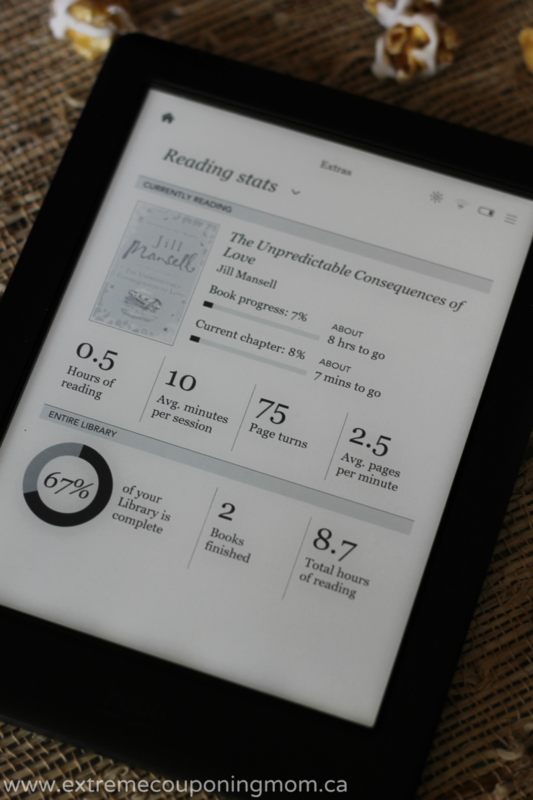 I really love the reading stats feature, the first book I read on my new Kobo Glo HD was Three Amazing Things About You by Jill Mansell. I read the book in 8.1 hours with an average of 24 mintues of reading per session and an average of 1.9 pages per minute. I honestly couldn’t put the book down and the Kobo Glo HD made it very easy to totally throw myself into it. I am now starting my second book by Jill Mansell, The Unpredictable Consequences Of Love and I am sure I will be done this one in no time! 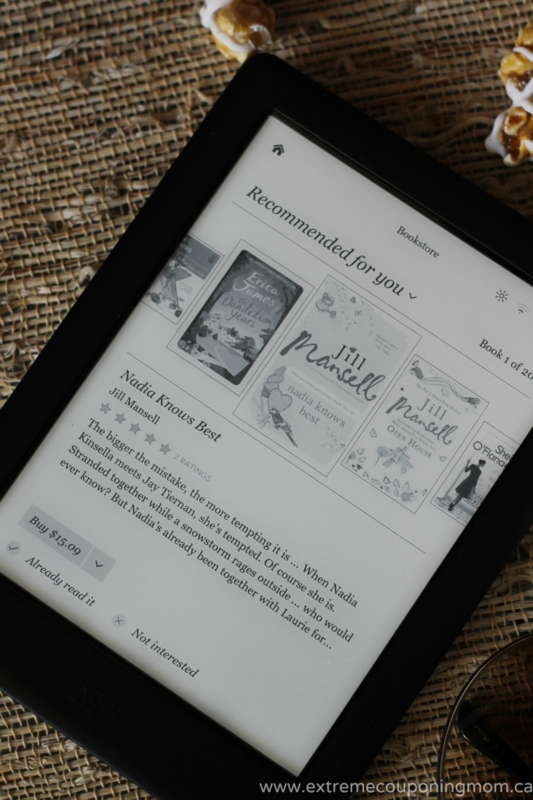 Another great feature of the Kobo Glo HD is that it offers amazing personalized recommendations based on your taste, clearly mine knows I love Jill Mansell and the other books it has recommended are of the same writing taste and style. I will be checking out some new authors and expanding my love for reading thanks to this feature! It also offers free previews and reviews which are a great help when looking for your next great read. You also have easy access to browse the massive Kobo eBookstore to discover your next great read! 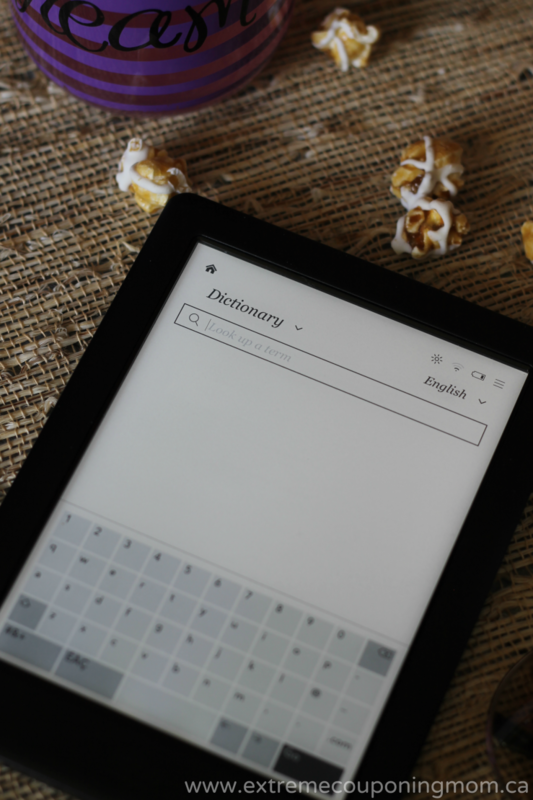 The Dictionary feature is perfect for my daughter Abby and I hope it will encourage her to read more. She has had some difficulty with language/reading in school and currently is getting some extra help from tutoring to bring her up to her grade level. I know one of the hardest things for her is comprehending what she is reading. Well if she doesn’t know what a word means she can easily access this feature and get the definition of the word so she can better comprehend what she is reading. Getting her to read has been a struggle and not because she doesn’t enjoy, so I am hoping this will get her more excited to read knowing she has access to help her understand words that may be above her current level. I did learn one important thing that you should pay close attention to when purchasing books for your eReader. When you click on a book to view more info or purchase it, make sure to scroll down to where it shows you what devices the book can be read on. It is very important that it shows it can be read on an eReader. I learned the hard way as one of the two Bubble Guppies books I purchased for Bella isn’t able to be read on an eReader, I didn’t know at the time to look for that and had no idea why it wouldn’t sync to my device when the other books had. It wasn’t until I went back to that books page, scrolled down and I noticed there was no eReader icon under what apps and devices it could be read on. Download the Kobo App available on iOS, Android, Blackberry 10, Windows 8 or Windows 8 Phone or Desktop Computer! I love that with the Kobo App I can read anytime, anywhere on any of my devices. I can easily finish off the chapter of my book I was reading on my Kobo Glo HD on my iPhone while I am waiting for the kids to get off the bus after school. So after 7 days of using the Kobo Glo HD I can proudly say I am no longer afraid of eReaders, I will continue to enjoy my Kobo Glo HD and think it will replace my purchase of real books for myself as eBooks are a much more frugal option. The Kobo Glo HD retails for $129.99 so go ahead and purchase yours today and join me in reading anywhere and everywhere you want! Stay connected with Kobo on Facebook, Twitter, Instagram, and Pinterest. 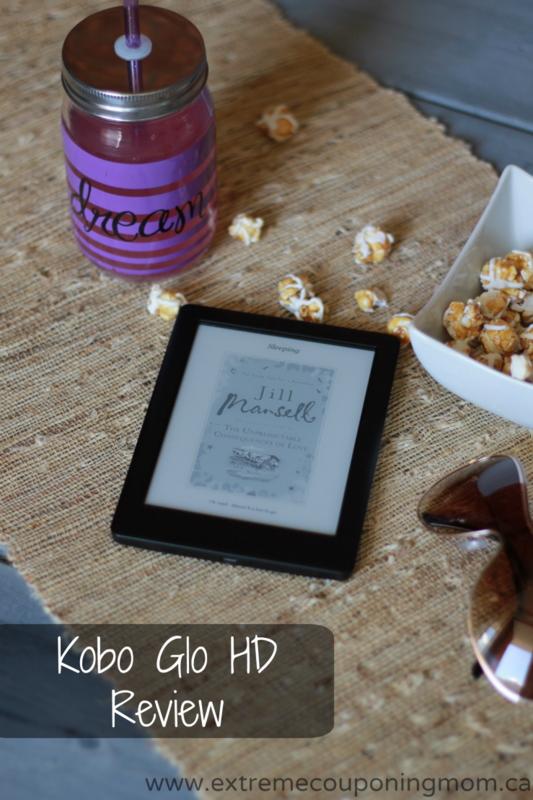 Take the Mom 2 Mom Challenge and give reading a book on the new Kobo Glo HD a try! 200 lucky readers are going to win a $10 Kobo Gift Card! The giveaway is open to residents of Canada (excluding QC) and the USA (excluding Alaska & Hawaii). The contest is being administered by PTPA Media and they will be selecting and notifying winners. See full terms and conditions in the giveaway form. Disclosure: I am part of the PTPA Brand Ambassador Program with Kobo and I received compensation as part of my affiliation with this group. Although this post has been sponsored by Kobo, the opinions and language are all my own, and in no way do they reflect Kobo. Any product claim, statistic, quote or other representation about a product or service should be verified with the manufacturer, company, provider or party in question.